Microsoft is going to show up their new suite of MS Office to the people attending the Professional Developers’ Conference next week. A slideshow of the timeframe of the launch of Office 14 has already been released on the Internet. 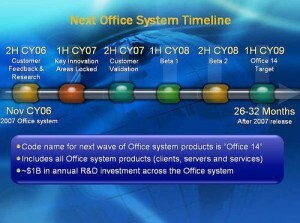 The official release date of Office 14 was expected to be shipped in the market in late 2009 or early 2010 with the release of Windows 7 operating system. The previous version of Microsoft Office i.e. Office 2007 was released in year 2007 and it was seen that there were some major changes in it. Office 14 will be implemented in OpenXML which was standardized as ISO 29500 in March 2008. Microsoft Office 14 will include the two new applications which will become the part of MS Office – Microsoft Office Visio and Microsoft Office Project. Bill Gates and Steve Ballmer both said that Office 14 is made more for the Internet. The new Office Outlook Web, is designed to give more features to the end users surfing the web from Internet Cafe’s.